Competition has begun for the second Bailing Cup, a biennial event backed by the Guizhou Bailing Group, a Chinese pharmaceutical company, and held under the auspices of the International Go Federation, the People’s Government of Guizhou Province, the Guizhou Sports Bureau, and the professional go associations of China, Japan, and Korea. Four preliminary rounds were held March 15-16 in Beijing, and the 48 survivors then joined 16 seeded players from China, Chinese Taipei, Japan, and Korea in the main tournament, with the first round held on March 18. Click here for Round 1 results and games, along with some of the preliminary games. 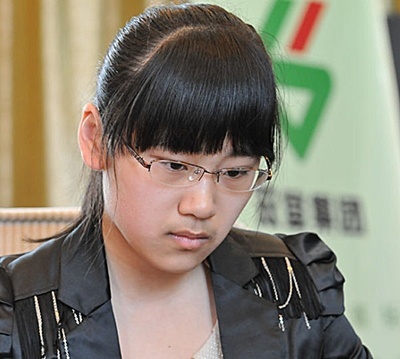 One of the winners in the prelims was a young Chinese pro who had recently won the Shanghai Jianqiao Xinren Wang tournament. This event is known as the Rookie King tournament, but this year’s king was Wu Zhibao 5P (Yu Zhiying, at left), a female player. It’s extremely rare for a go tournament that is open to both men and women to be won by a woman; in the entire history of professional go it has happened perhaps five times. Three of those victories were by Rui Naiwei 9P (right), who Wu faced in the first round of the Bailing Cup, losing by resignation. The second round has yet to be scheduled; the ultimate winner of the second Bailing Cup is due to be decided next year.